Last week I reviewed the Highland Park 15, the least loved of the Orkney distillery’s regular line and apparently marked for extinction. Today I have its younger sibling, the Highland Park 12, an altogether better known and more popular whisky (though not the youngest in Highland Park’s range anymore). As you have doubtless become sick of hearing, the Highland Park 12 is considered the all-rounder of single malt whisky, bringing together the major characteristic aromas and flavours of single malt whisky. 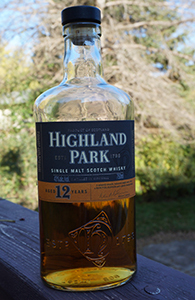 If someone is new to single malt whisky and wants tips on what they might like it’s not uncommon to hear whisky geeks recommend that they try Highland Park 12 and note which aspects of it they like—the smoke, the sherried notes, the citrus, the sweetness, the brine. It is also remains a very reasonably priced whisky—available in Minnesota for less than $40. It was one of my gateway malts—along with the Clynelish 14, the Talisker 10 and Laphroaig 10, it confirmed my ensuing obsession with single malt whisky and with Highland Park in particular (it is one my very favourite distilleries). And it has been a staple on my shelves ever since. I am pleased to finally be reviewing it for the blog. Nose: Raisins, a touch of caramel, orange peel, mild leafy smoke and a light rubbery note. Some briny/sweaty notes after a bit and it also gets sweeter as it sits. Not a whole lot of development after that but with water added it brightens up dramatically, with fresher, floral notes and the caramel turning to toffee. Palate: Similar to but more intense than the nose (and also far more intense than the 15 yo) with the sherried notes (raisins, caramel, orange peel) up top and the peat anchoring them below. On the second sip there’s some apricot with the citrus (which gets brighter) and also hints of gunpowder. Better mouthfeel than the 15 yo too. The rubbery note from the nose shows up late—seems more related to peat than sulphur, and isn’t off-putting. Gets brighter with a drop of water; also gets smokier and the rubber gets pushed back. Finish: Medium. Gets quite bitter as I swallow, presenting a nice counterpoint to the initial sweetness. Some menthol coolness as it goes. The bitterness gets more chocolatey with each sip and there’s some salt too with time. Comments: I see my notes merely repeat my brief description of the whisky in the introduction. This is just good, solid whisky. As I noted, it’s more intense than the 15 yo and most evenings—especially in the autumn and winter—I’d be more likely to reach for this. Nice development with water too. This entry was posted in -Whisky by Rating, 85-89 points, Distillery, Highland Park and tagged *Whisky, Highland Park, Orkney, Scotch, Single Malt. Bookmark the permalink. Thanks for reviewing a standard–gives additional insight into something I’m very familiar with and into your opinions. A great fail-safe of a whisky. I’m meaning to get round to reviewing this one myself – perhaps the same week that Ted does the Scapa. Crazy the difference that a few kilometres of beach makes! I’ve been going through the rest of this bottle at a very rapid rate. Tonight it’s actually putting me in mind of the Yoichi 15. Must try them head to head soon.